It's time for another "Monday Madness... Imagine That" with My Creative Time! 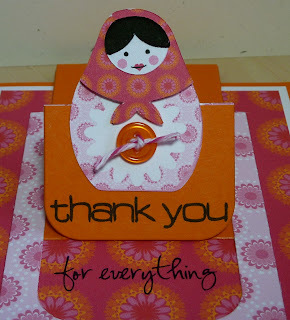 Today I'm showcasing Emma's So Grateful for You stamp set. 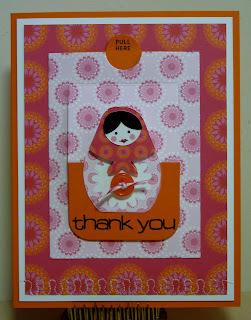 I used the Cricut Imagine All Wrapped Up cartridge for my patterned papers and my little Russian nesting doll. The doll is cut at 2", using the layers, and I added a little button and some twine for extra detail. To get the slider action on my card, I used the new Papertrey Ink Movers & Shakers: Sliders Die Collection. 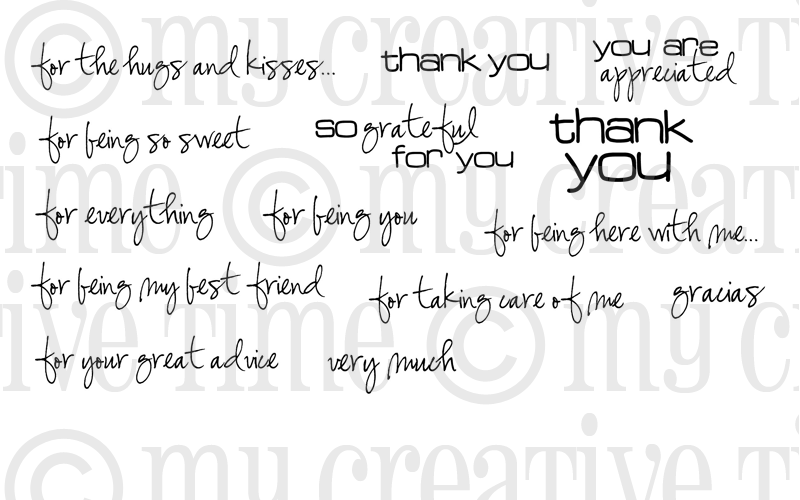 I love how you see the "thank you" on the front of the card, but when you pull out the slider, it reveals "for everything." Here's a look at the card without the slider pulled out. I took my first sewing class this weekend, so I just had to try adding some machine sewn embroidery across the bottom of my card. 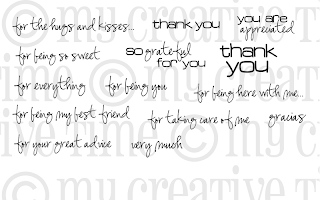 The entire My Creative Time So Grateful for You stamp set is shown below. It's perfect for any occasion and is available at the My Creative Time Store now. Be sure to stop by Emma's blog to see the awesome projects that she and the rest of the design team have to share for you today! Kaite ~OMG! First I LOVE the pattern from the Imagine you chose! Then the new PTI slider die but last but not least the sewing!Emma's stamps fit so pefectly with your card! Oh WOW! I really LOVE it! I can't wait to see what else you do with sewing! Great job! Love this slider card! I placed an PTI order last week and told myself I didn't need the Movers and Shakers dies...I think I may have been wrong! Great job Katie! Love it! I am so going to order some of the dies. How pretty, great job with the sewing machine. I am loving the interactivness of your card. I am going to have to check out & consider buying the shakers & movers. Thanks for sharing such a great card. AWESOME slider card!! 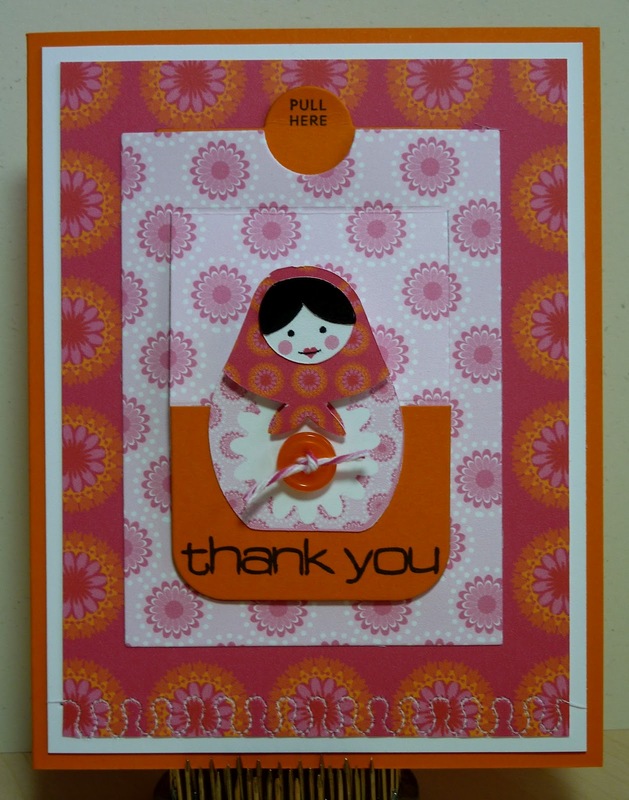 I love that little babushka doll and how she slides to reveal the rest of the sentiment. Fab job!! Wow! What a cool card!! Love the colors and the little doll. The slider is awesome! Katie, you're one of my biggest enablers! I didn't get to order from PTI and I want those Movers and Shakers now!! I blame you! Love the card. The colors are amazing. Great job! What a great fun card! I love it!! I am pretty sure you will have a lot of fun in your sewing class and will be glad you took it. You are just too awesome.... This amazing. What a neat card! Love that it's different :) colors are great too! I love this card,Katie! Awesome colors!! Love how you stamped the sentiment!! I'm glad you shared with us how you made the slider. I was wondering how you made it. Also I like the way you show pictures of the items you used to make your cards. Very unique.